Stews are a great family meal in the winter. They are comforting, filling and they don't break the bank. These days we all have to be more careful with our money, so it really is something to think about when you're shopping for groceries. 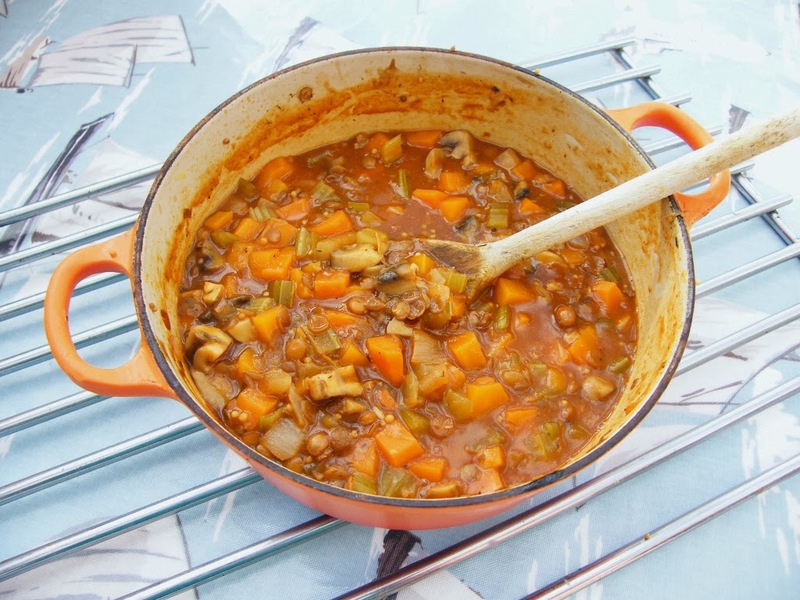 This stew is made from some basic vegetables and tinned lentils and beans and has the most delicious gravy. Of course you could use dried beans and lentils and this would be even more cost effective, but I'm never organised enough to soak them the night before, so I make sure I have plenty of tinned beans and lentils in my store cupboard. The quality of tinned beans and lentils is really good these days, but like I say, you decide. The Co-operative Electrical are running a competition asking for Winter Warmers just like this one, so if you are creating your own Winter Warmer on your blog, why not link up for the chance to win £750 worth of electrical goods? One runner up will be offered £250. It doesn't have to be a stew, you could make a soup, a pasta dish or even a pudding, it's up to you! You have until 21 February 2014 to post your dish and enter. You can read the rules here. Good luck if you do enter! A simple stew that the whole family will enjoy. Serve it with mashed potato and lots of extra vegetables or serve it simply with some crusty bread. 1. Heat the oil in a large heavy bottomed pan and add the mustard seeds. Leave them for a couple of minutes until they start making popping sounds, then add the onion, leek, celery and garlic. Saute until soft.2. Add the carrots, pop the lid on and leave to cook gently for 5 minutes.3. Add the mushrooms, kidney beans, lentils and thyme. Cover again and allow to cook for a further 5 minutes, stirring occasionally.4. Add the stock pot to a measuring jug and top up with boiling water to the 400ml mark. Stir well until dissolved and then add to the pan, along with the HP sauce and tomato puree.5. Add a little water to the cornflour, to make a runny paste. Add this to the pot and stir well. This will help to thicken the gravy.6. Cover the pot and leave to simmer gently for 30 minutes until the vegetables are tender and the gravy is thick.7. Enjoy! Here are a few more of my winter warmers for inspiration. Disclosure: I was paid to write this post for Co-operative Electrical. I was not required to write a positive review and any opinions expressed are my own. The stew looks perfect and so very delicious.Please do send it to my events Flavours of the world Grand finale and Lets cook with green Veg at simply.food and In my VEG BOX ~Carrots at citrusspice. That looks both tasty and like something my Dr will allow me to eat so I think I'll grab that and give it a go tomorrow. I know what you mean about dried pulses v tinned, I used to have a pressure cooker and that made short work of dried pulses. Nowadays I too generally use tinned but red split lentils can just be dumped straight into the stew and cooked with the rest of the veggies. Yeah, I use red lentils a lot too. I just don't have a lot of time. I hope you enjoy it Mike. Ahhh, I passed that one by as it was dried herbs, but if you are happy then I shall. There's no citrus in this one Karen. This stew looks delicious. Full of healthy goodness and looks to be very filling too. Thanks Tina, it's a good one alright! Hi there! This looks amazing and perfect for the winter. I'm in the U.S. and wondering if I can substitute ketchup or something else for the HP brown sauce? It's a tangy, slightly fruity sauce. You could use a BBQ sauce instead or people seem to equate it with A1 sauce. It might be the nearest thing. We're trying to eat a few more vegetarian meals, and this sounds perfect, my husband will love it. And your other winter warmers look delicious too. Yummy Jac, I do love a lentil stew and yours sounds no less than delicious. Great challenge from the Co-Operative, might try and join in too! 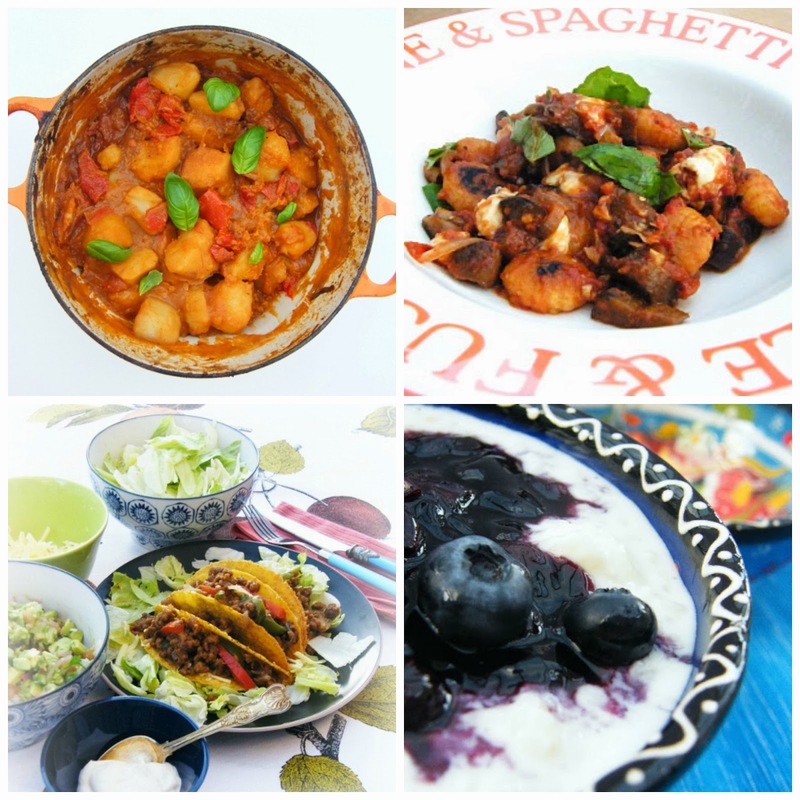 Thanks so much for linking up to Four Seasons, it certainly is a Virtuous dinner! I'm a lentil fan too! This looks like an excellent recipe and definitely a winter warmer. And, I MUST sit down and do some challenges this weekend! Thanks Fiona. I usually just see what my finished recipes fit with, there are usually a few in The Food Blog Diary and of course there is this Co-op comp too. Ooooohhh, I know what I'm having for dinner tonight...Thanks for the recipe! Looks yummy! I am eating a lot of lentils at the moment, just because they are so cheap, healthy and filling. They are good. We probably eat more red lentils than any other kind. What a hearty, warming and tempting dish this looks to be. I never remember to soak beans and lentils and so always buy them in tins now too. Such a handy cupboard standby! They are so handy and can be added to all sorts of dishes. A must have in my opinion. Your stew looks so colourful it makes it seem even more enticing and I don't need much persuading once I know lentils are involved. Looks so inviting - I'm craving a veg stew for lunch now but will probably have to wait until Sunday as my fridge is bare!! A bare fridge is never a good thing, although I happen to know you are great at working with what bits you have left in the fridge and store cupboard. I need to do that more often. *drool* If I was closer I would probably knock on your door right now with a bowl and spoon! I love hearty veggie stews, it's my number 1 comfort food at the moment! What a top dish Jac, love it and think this is a post I will be back visiting regularly. I also love your new header. Being a big art fan I would always warm to your design but even more so because I know you! Awwww thanks Laura, although it was my friend's sister who did this one for me. I don't do much painting myself anymore. Cooking has taken over. Been making lots of stews actually all involving black-eyed beans. Gonna have to try this one. I am quite a new convert to black beans, but I love them! Looks very hearty and delicious, lentil lovers here and most pulses, we have a meal like this weekly, stretches to lunch the next day which is a bonus! Indeed and the flavour is even better on the second day. A real winner. I am going to make a bacon and bean stew soon, I use the cooking bacon from Sainsburys or Morrisons - much cheaper than formed bacon pieces. Can you freeze this please? As a matter of interest, what determines whether a recipe will freeze or not? It's basically what the dish is like once it has defrosted. Too be honest most veggie dishes are ok when defrosted. Hi. Sounds great! What's HP Brown sauce? It's a sauce available here in the UK. It's a fruity brown sauce, a condiment a bit like ketchup. You could use worcestershire sauce, or a bbq sauce to add a bit of extra flavour. Yes, but you would need much less stock and this is a big serving, remember don't overfill your crockpot. Hi Cassandra, It is a spiced sauce which is tangy or fruity and popular in the UK. You could substitute with a BBQ sauce, a sweet tangy steak sauce or leave it out, although it does add a flavour note. about how much dried lentles and beans would be the equivilent of canned? Check out the guide in this post and in case it helps 400g is just under a pound (cooked weight).